JVC is Living With Purpose by turning March Madness into…Casserole Madness! Help bring fresh, homemade meals to families living in need! Drop off Date is Monday, March 25th! Who are we helping? 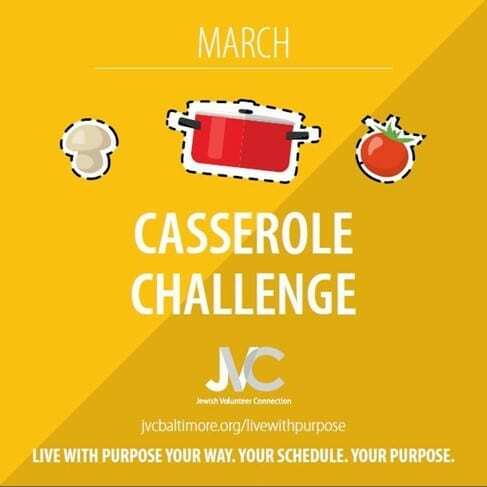 Last year we collected close to 400 casseroles and we are hoping to make an even bigger impact this year. Recipients include a variety of local organizations that support families and individuals in need. Recipients include Living Classrooms, Sarah’s Hope Mount Street. Make your favorite casserole/meal in the casserole tin. Place a label on the cover of the casserole with an explanation of what you made and any key ingredients or common allergens. Freeze casseroles or make sure they are freshly delivered. Did you know? Nearly half of Maryland’s hungry are working—people who don’t make enough to provide both healthy food and a safe home for their families. Learn more about the issue of homelessness and hunger and use discussion questions with your family/group! Click Here for more information! Want to Participate? Register Today! Casserole tins can be picked up at the Park Heights JCC, after coordination with staff. Alternate arrangements can be made as needed. Weinberg Park Heights JCC 7:30 – 10:30 a.m.
Weinberg Park Heights JCC 2:00 – 4:00 p.m.
Rosenbloom Owings Mills JCC 1:00 – 3:00 p.m.
Lifebridge Health and Fitness 9:00 a.m. – 12:00 p.m.